Welcome to the second edition of BISMA E-news. We have a packed edition for you this month with an update on ISMA's new Six Metre Archive project, details of the draft 2019 programme, fascinating articles from Ian Howlett and class measurer David Chivers, plus a host of other class news so please read on. We've had a terrific summer of sailing and I am delighted to report that we have several potential new owners interest in joining the class. To keep the momentum going we're working hard to get the 2019 programme confirmed as soon as possible, and we would encourage all of you to commit to as many events as you possibly can. and we have reports, photos and videos for you below. We also have news of next year's World Championship, which takes place in Hanko, Finland and where I hope we will also see good British representation. Our next significant class event will be the AGM on 2 November and I would just like to remind everyone that the closing date for any resolution to be proposed is Friday 12 October, so please get your submission to Violeta promptly. Finally, don't forget to send Enews Editor Fiona Brown your photos, videos and stories for inclusion in future editions of the E-news. This is your publication and we want to tell your stories. The 2018 BISMA Annual General Meeting will take place on Friday 2 November 2019 at the Royal Southern Yacht Club at 7pm. The meeting will be followed by dinner at the yacht club. The Agenda and supporting information has been emailed to members directly. Contact Violeta at secretary@6mr.org.uk for further details. 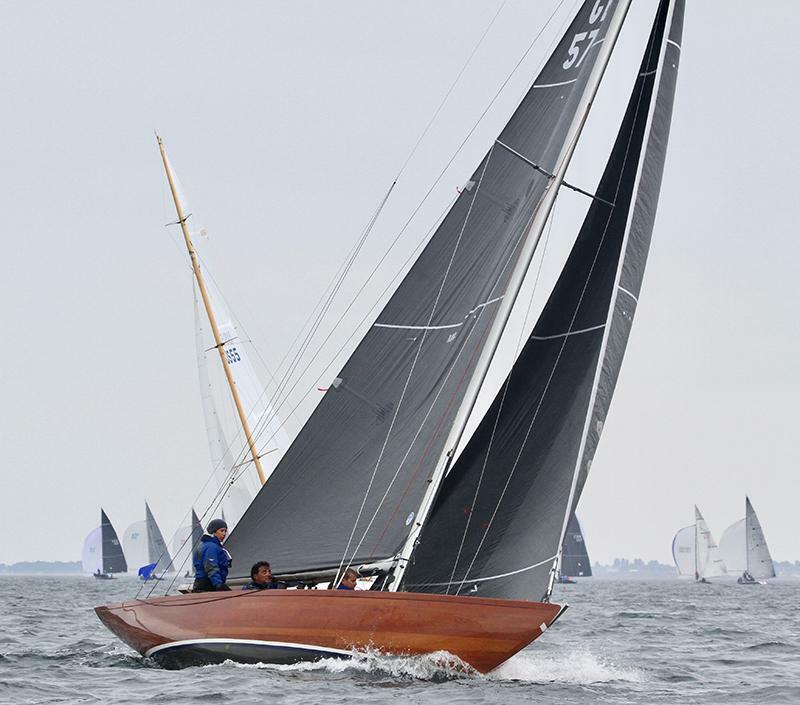 At present the Six Metre class is growing in popularity, with the classic boats enjoying a particular resurgence. 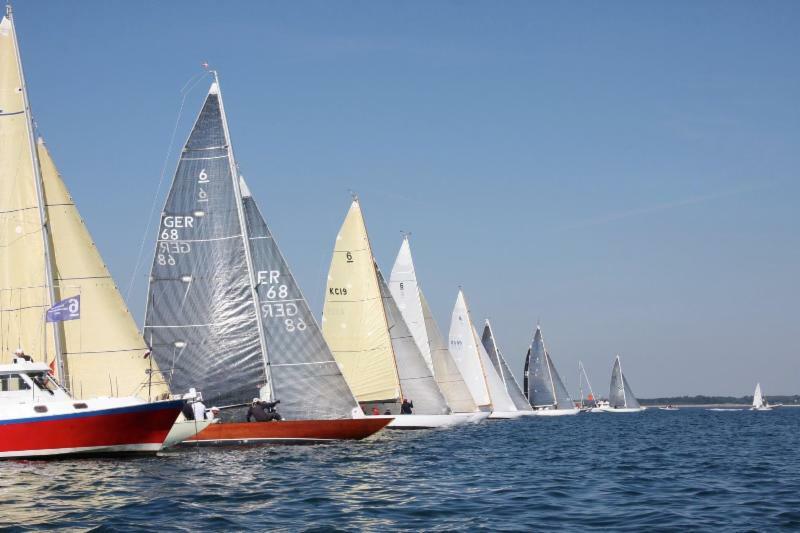 Many of the owners of these boats are becoming concerned about preserving the history of the class and recognising the importance of the Six Metres within sailing history. There are many people within the class who are hugely knowledgeable about the boats, and in 2007 a book on the class history was published to celebrate the 100 th anniversary. There is a growing feeling, however, that a digital archive would help to record and preserve the original documents and primary material from which we can learn about the class. ISMA does not have its own archive, but a lot of archive material is known to exist in various places worldwide, such as yacht clubs, yacht designers, individual collections, museums, etc. ISMA’s project plan is to develop a virtual archive, collating and digitising source material and bringing it together into a website. The archive will mainly consist of digitised paper material and might include drawings and plans, certificates, race reports, regatta programmes, newsletters, photographs etc. It may also include some 3-dimensional objects such as models or trophies. 1) A searchable catalogue of digital archive material as described above. This will be the primary focal area of the site. 2) A record of historical race results. 3) Fact sheets for each boat, including details such as the name, build date, designer, builder etc. ISMA would like to be able to add more features to the website over time including, for example, an oral history section, articles by guest contributors or online exhibitions. Work has already begun on the project and it is hoped that the first phase of the online archive will be launched in early 2019. It is anticipated that the main body of the project will take 3 to 5 years to complete, with a commitment to ongoing updating beyond that. Jenny Wittamore, a highly experienced professional archivist, has been appointed as Project Manager and is keen to hear from anyone who has materials or information which should be included. ISMA appreciates that many of the documents it wishes to include are of significant historic value and may be in a relatively fragile state. Where possible materials should be sent to Jenny for digitising, but where materials are too fragile or valuable to transport arrangements can be made for Jenny to come to site to undertake the necessary work instead. Any materials sent to Jenny will of course be returned to their owner as soon as possible once they have been digitised. One of the most important sources of material will of course be you, the owners and sailors. Both in terms of material for the individual record page for each boat and the wider project, any information or documents you hold could be of value. Photographs, film or video footage, technical documents and drawings, records of ownership, race results, event programmes and documents, interesting stories of the boats exploits, details of well known sailors or public personalities who may have sailed on boats, etc, etc, could all be of immense help to Jenny in building the archive. Please review any Six Metre records you might hold and contact Jenny Wittamore on Email: archivist@6metrearchive.org with details. It is with great sadness that we must pass on the news that Pierre-Paul Heckly (The Maharajah) died on the night of 1st October. Pierre-Paul owned a number of yachts of the International Six Metre Class, most recently FRA 111 ‘Dix Aout’. He campaigned these boats enthusiastically, and achieved considerable successes in both the European and World Championships of the Six Metre Class. As well as his successes on the water, Pierre-Paul played a significant role in yachting administration, as a former President of both the French Dragon Class Association and the French Six Metre Class Association. He was also a past president of the Yacht Club de France. Our thoughts are with his family at this sad time. 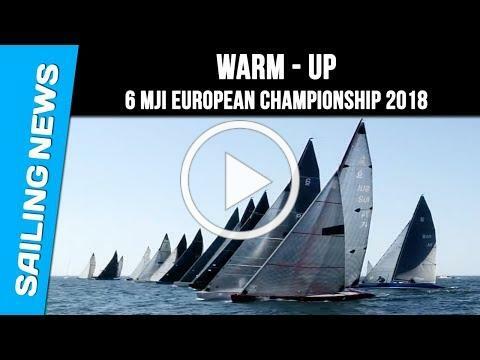 The British contingent put in a strong showing at the 2018 International Six Meter European Championship in La Trinite sur Mer, Brittany from 29 August to 8 September, with four Classics and four Moderns racing. 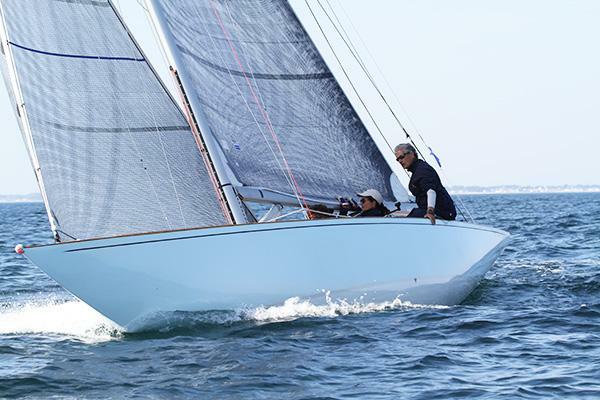 This year a very healthy fleet of twenty “Classic” Six Metres arrived ready to race in La Trinite for the 2018 Europeans. There were four British boats, although with Titia so recently moved to Spain but for so long the stalwart of the UK fleet, it feels strange not to count her! Erica, Valdai, Mena and Abu competed under GBR sail numbers and all did well in a very competitive fleet, finishing 5 th, 12 th, 14 th and 15 th respectively. Monday (day one) brought light airs and interesting sailing in beautiful sunshine. Erica and Valdai both performed well in the light breezes and were probably both hoping for a light week! Tuesday (day two) started in heavier airs and near perfect sailing conditions. Both Mena and Abu clearly relished these windier conditions and posted improved results (9 th & 12 th). Unfortunately the wind completely shut down as the Classic fleet finished race three and eventually the race officer sent both 6mR fleets back to the clubhouse without another race. Wednesday (day three) started an hour early as the race officer set about trying to catch up from Tuesday, particularly as the forecast for Friday was already looking very light indeed. 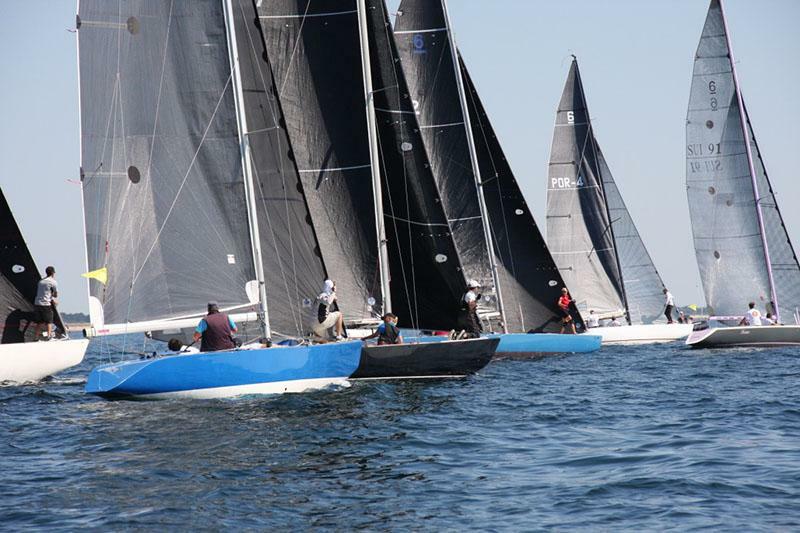 The fleet completed three races in shifty, squally conditions with 10 to 20 knots of breeze. Bribon Gallant had a very strong day finishing with a 3 rd and two 1 st places. This put her into an unassailable lead after Llanoria & Erica also both scored OCS in race four. However both boats then recorded 4 th and 5 th places each, with Astree also having a strong day with a 2 nd and two 3 rds. Valdai performed well in race four (9 th) but struggled after that in the building breeze. 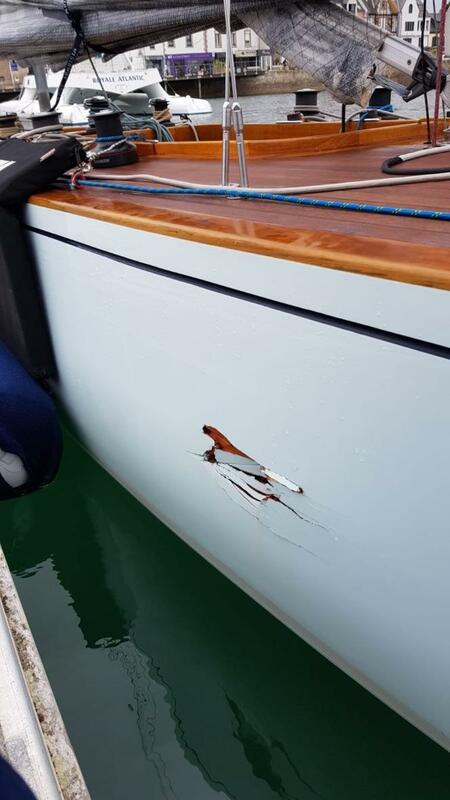 Unfortunately Abu was involved in a start line collision with Titia at the start of race five, which dramatically changed the regatta for both boats. 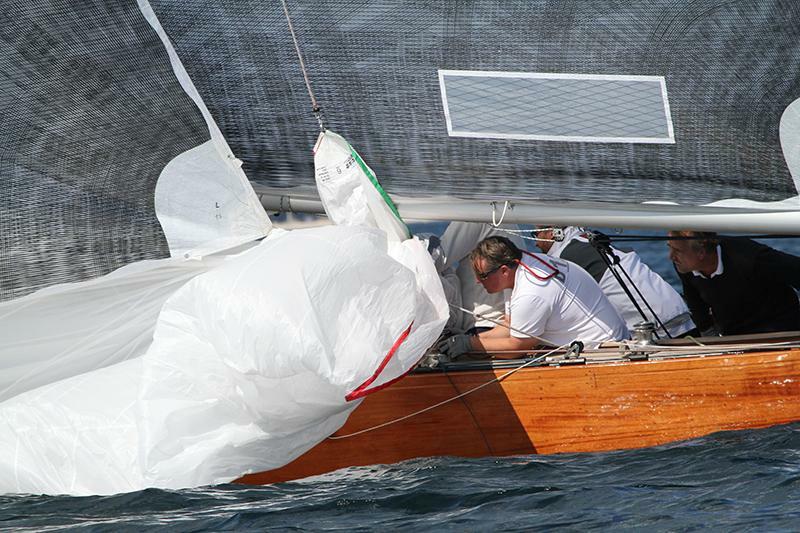 Abu ended up losing out in the protest room after damaging Titia’s starboard topsides and so carried two 21 point races, which was a great shame after she recorded a good result (6 th) in race four – what might have been! Titia was unable to race again, which was also very disappointing for her owner and crew from Sanxenxo, Spain. Thursday brought beautiful conditions again for two great races – a wonderful way to finish the week. Mena concluded the series with an excellent 6 th place, her best result of the week as her new crew finally found their rhythm and Valdai consolidated her 12 th position overall with 10 th and 11 th. The Erica team had their least successful day but still finished the week strongly in 5 th place overall, an excellent result for a group so new to Six Metre sailing and in a very recently restored boat. I am sure that we will continue to see more excellent results from Erica in 2019. Eighteen “Modern” Six Metres turned up ready for battle on Quiberon Bay, La Trinite, for the 2018 Europeans. Like the Classic fleet, there were four British boats, St. Francis IX, Valhalla, St. Kitts and Cream that finished 4 th, 9 th, 12 th and 13 th respectively. 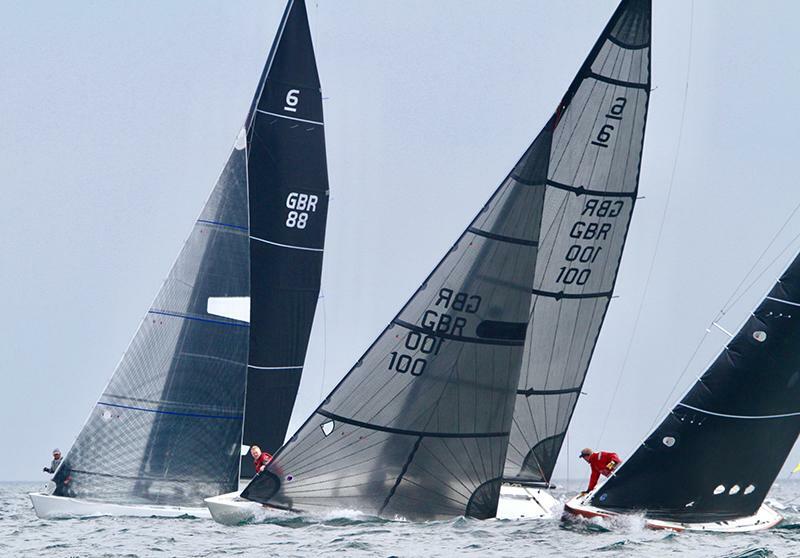 Every year the level of competition in the Modern fleet seems to keep rising and this year was no exception. A new European Champion from Switzerland this year (and not Junior! ), a new Portuguese entry in the top three (Seljm) and the revamped Thisbe finishing competitively in 7 th place. Monday (day one) started in light airs and the first start had four boats over early, but the British took 2 nd and 3 rd places with St. Francis IX and St. Kitts. 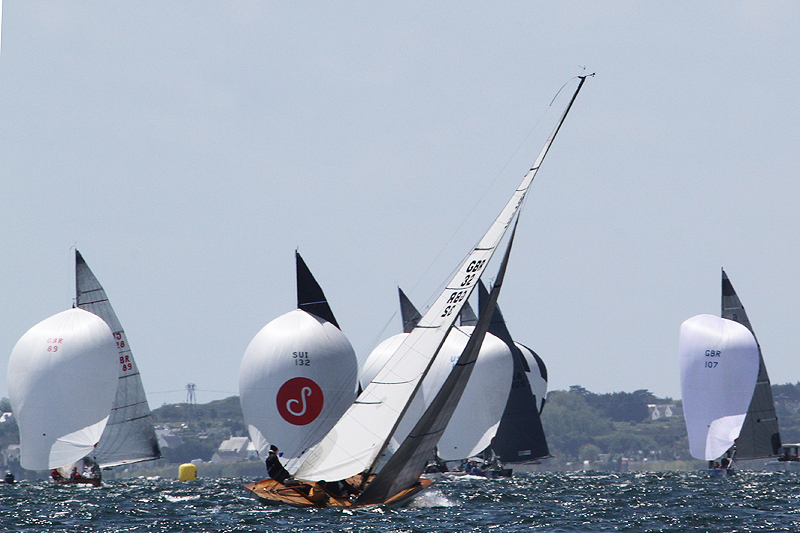 The second race finished in even lighter breeze that left the standings very tight by the end of the day. 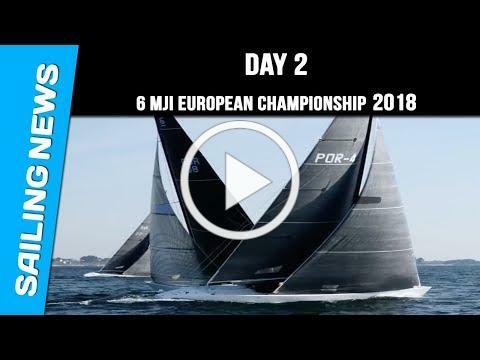 Tuesday (day two) morning brought much heavier breeze with near perfect sailing conditions, which the Modern fleet clearly enjoyed much more than Monday. St. Kitts & Cream struggled to get going in race three but both St. Francis and Valhalla showed good pace at the top of the fleet where placings changed continuously. Soon after this race, the breeze dropped steadily and by the time the Classics finished, there was little the race officer could do for race four. Eventually he abandoned racing for the day with an early start set for Wednesday morning. Wednesday (day three) started in shifty, squally conditions with 10 to 20 knots of breeze. St. Kitts and Cream both had better results in race four with 7 th and 10 th respectively, but St. Francis IX and Valhalla struggled with 12 th and 13 th – results that both boats would ultimately discard. Race five was a different story again as St. Francis IX battled away with Seljm and finally took 1 st place. Valhalla & Cream both enjoyed race six in the afternoon and put together their best races of the series with 4 th and 8 th places respectively. The day ended with St. Francis IX in 5 th place overall, the highest placed British modern, despite their win in race five with the competition fierce at the top of the fleet. 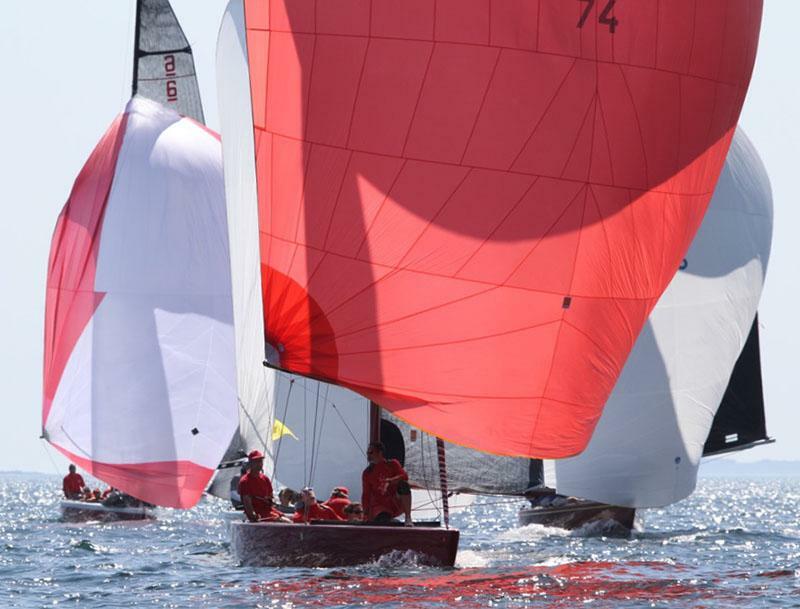 The final day, Thursday, brought beautiful conditions for the last two races of the regatta. The eventual winner of the Modern fleet and Open division went right down to the last race, with Nivola taking first place by just one point after winning race eight from Junior, who came in 2 nd place after a late charge through the fleet – only 11 seconds separated them in the end. St. Francis had a good day taking 3 rd & 6 th places to finish 4 th overall with only 3 points separating 3 rd place from 6 th!! Valhalla recorded a 5 th in race seven but discarded 19 points for the last race so slipped into 9 th overall. St. Kitts and Cream finished 12 th and 13 th overall, with St. Kitts finishing with a good 7 th place in the last race. 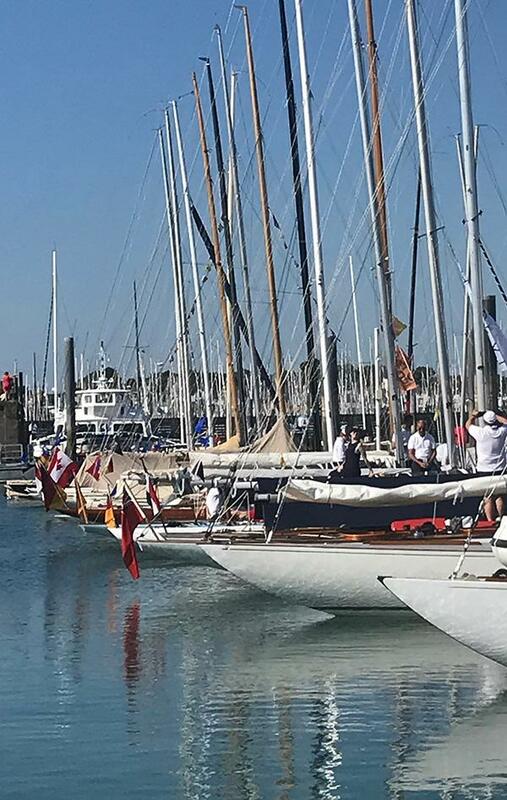 Once again La Trinite Sur Mer and the hosting club SNT produced a brilliant week of sailing and entertainment, with a total of 38 teams competing across both fleets from 10 different nations. The 6mRs will certainly be back again to race in Quiberon Bay soon enough. The Design and Building of the first ‘Modern’ Six in the UK. I thought that the correspondence below would be of interest to Six Metre sailors in general but in particular to members of BISMA. Erik Maxwell was the first Chairman of BISMA and the elegant sponsorship of the British Championship by Famous Grouse in the mid 1980’s came about via his friendship with Matthew Gloag. ‘Iskareen’(S&S 1939). The latter, which Erik felt possessed very special characteristics, was from that same vintage era of the 1930s as the S&S Six Metres ‘Goose’ and ‘Djinn’ and the S&S 12m ‘Vim’. Erik’s principal focus in yachting at that time, was to build expertise in design, sails and racing, in order to mount a realistic British challenge for the America’s Cup, which for him had been a boyhood dream. With that objective in mind, ‘Sceptre’ was shipped out to Newport RI, for the America’s Cup summer of 1967 and to improve her performance, Erik invested in a new suit of Hood sails, of just the same type as those on ‘Intrepid’. During that summer, ‘Sceptre’ acted as the ‘tune up boat’ for ‘American Eagle’ and in the course of their extensive trials it was established that the performance of the two boats were almost indistinguishable up to 15 knots of wind. revolutionary/breakthrough ‘Intrepid’ came out with a separated rudder and trim tab. Significantly she was helmed by Bus Mosbacher who had previously distinguished himself steering ‘Vim’ and ‘Weatherly’ in 1958 and 1962 respectively. 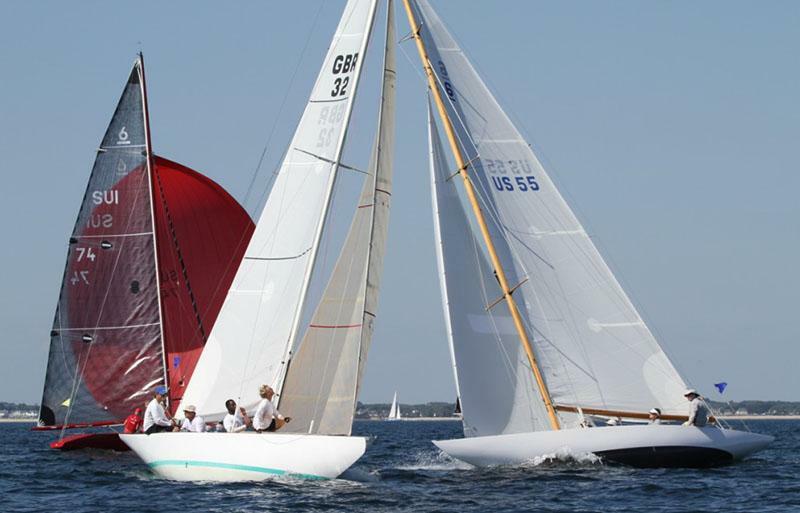 During that summer in Newport, as well as making enduring friendships within the NYYC, Erik would have got to know Olin and Rod Stephens well, as is apparent in their correspondence. Erik also instigated and financed the 12m hull researches carried out in 1968/9 in the towing tank at the Stevens Institute by his good friend and close neighbour David Boyd. Prior to ‘Gosling’, the last Six built in the UK had been ‘Royal Thames’ (David Boyd 1956) for a RTYC syndicate and in 1970 that gap of fourteen years must have felt an eternity. Reflect today however when no new Six has been built in the UK since 1989 - almost double the previous interval. And that, following gains in performance unparalleled in the history of the Class. ‘Gosling’ would have been intended to gain valuable insight into the latest S&S design thinking, as no doubt was a Clyde GRP 8m project that never bore fruit. Her name was a tribute to her distinguished ancestor ‘Goose’ and also reflected Erik’s abiding interest in the study of wildfowl. As with all the S&S Twelves from 1964 onward her lines were drawn by Mario Tarabocchia. The 1970 America’s Cup was not a comfortable one for those who worshipped progress, as, when the Cup and the Season were over, many seasoned observers were of the opinion that the 1970 Twelves were actually slower than the boats launched in 1958, the former having been developed using towing tank models that would later be acknowledged as too small (built to a scale of 1:13.3 they weighed about 14kgs) to produce reliable results. What is more, back in 1958 the new crop of Twelves had struggled to get the better of the 1939 ‘Vim’. ‘unusually good reports’ of the performance of ‘Toogoowooloo lV’ (design date Nov 1966) which at that time would have been in her unmodified ‘full keel’ configuration. Interestingly Richard Day of Washington, made just the same observation in recent correspondence. Erik’s passion for the America’s Cup continued until its departure from Newport in 1983 and his commissioning of the design/build of ‘Kirlo’ in 1980 (the first build to follow ‘Gosling’ in the UK) was undoubtedly with the same aim in view. I will write properly about ‘Kirlo’ and where she came from in another edition of this newsletter. Reading the above I am struck again by the folly of having a ‘Classic’ cut off date of December 1965 and perhaps it is now time to reconsider such, as Tim Street has of course long desired and recommended. In this first of occasional articles on the technical side of the class by Measurer David Chivers we are going to look at certification. As a design class, measurement and certification is central to keeping the boats within the class rules and to ensure fair racing. You are required under the Racing Rules of Sailing (RRS) 78, to have a current valid class certificate to take part in racing. If you race as a Six Metre in any event you must have a valid certificate and ensure the boat complies with the rules. 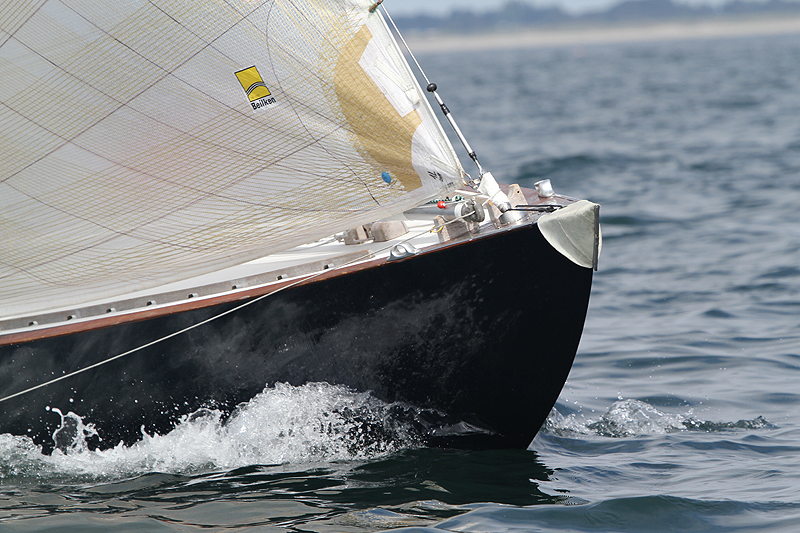 The International Six Metre Class Rule 29 gives the details of how to maintain this certificate. Each certificate is only valid for four years and must be renewed, preferably before it expires. In the UK, certificates are issued by the Royal Yachting Association (RYA) who will want to see that the boat still complies with her certificate of rating and will almost certainly want to see the boat weighed and that she still floats on her marks. If this is the case then a new certificate can be issued. Classics using the allowance in Appendix A of the class rules will be treated slightly differently. Please note that for any boat sailing under GBR a certificate issued by the RYA is the only valid certificate. No other person may issue a certificate for a GBR boat as they would not be valid. During the four years of a certificate you are required to ensure that the boat remains within the class rules and continues to match her certificate of rating. Class Rule 29 lists a number of situations which may invalidate the certificate and these must be noted and care taken to have the boat re-measured if necessary. We must also mention some other details which invalidate a certificate if not present. These are the measurement marks on the hull. A series of dots, stripes and triangles must be on the boat at all times and obviously in the correct place. If you refinish the boat at any time it is essential that the correct positions are noted before work commences and they are accurately replaced when work is finished. Your mast should have two black bands, one at the top of the boom and one at the mainsail hoist and also a band on the boom at the max foot length. These bands are set as part of the rating certificate and must be clearly marked. The mainsail must not be set outside of these marks. Finally, Class Rule 12 requires that all your sails are measured and carry an ISMA sail royalty label. If you are unsure of any of the points above, please contact ISMA Class Secretary Tim Russell on secretary@6metre.org before you undertake any work. Titia started the Six Metre Europeans regatta with an excellent series of results. She was lying fourth after day two and then recorded a fourth place in race four. Unfortunately then disaster struck as Abu holed her through the starboard topsides on the start line of race five. Despite late night repairs, she was unable to compete in the last four races of the event. Mauricio Sanchez-Bella, her new owner and President of the Spanish fleet, then decided to send her straight to Fowey for her now urgent repairs. How strange it must have felt for Titia as she travelled on the ferry from Roscoff to Plymouth, coincidentally accompanied by her long time Cornish stable mate Cream and on a journey she has done so many times before, and from there on into Cornwall to Tom Owen’s specialist Six Metre yard in Fowey. Work has already started, with Andy Postle from Allspars assessing the rig and Tom and his team straight to work on the damaged topsides. She broke four frames in the collision and the double layered topsides were completely punctured just forward of the starboard shrouds. The planking will now undergo a complex repair, particularly the inner ¼” thick diagonal layer. 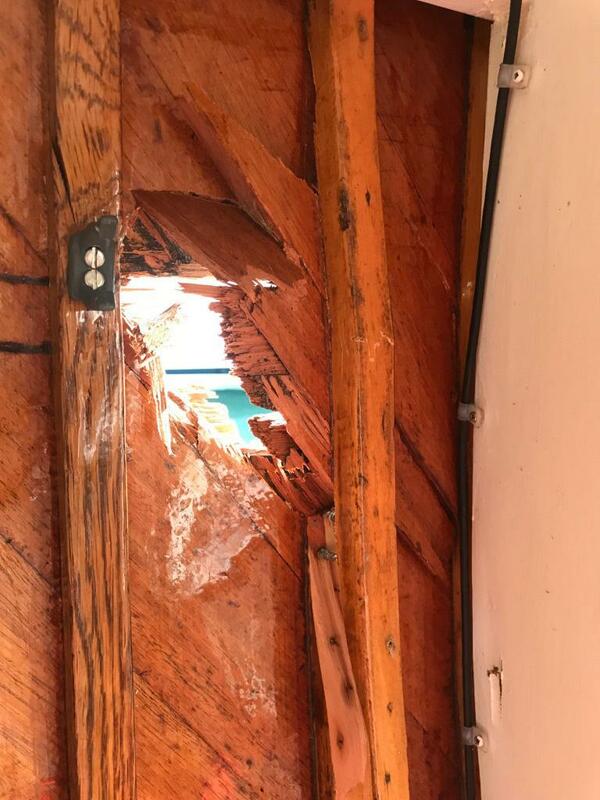 Further winter work and updates were already planned before her unlucky collision in La Trinite Sur Mer, in particular a re-caulking of her teak deck. Now that she is safely tucked up in Fowey, Titia will certainly have a relaxing winter stay in Cornwall as Tom and his team endeavour to return her to her former and recent glory. Your committee is currently working on the 2019 BISMA Programme. A draft outline of the programme is now available on the Website and dates and details will be confirmed as soon as possible. 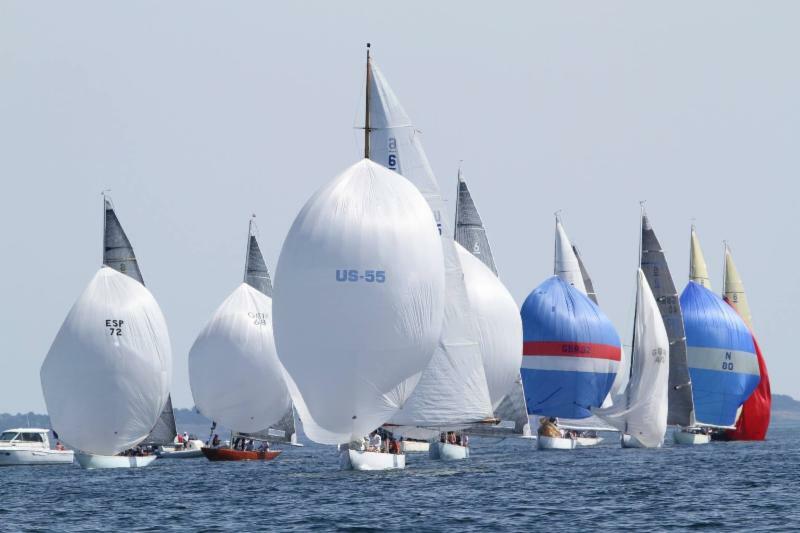 Hanko in Finland will host the International Six Metre World Championship 2019 from 2 to 9 August. 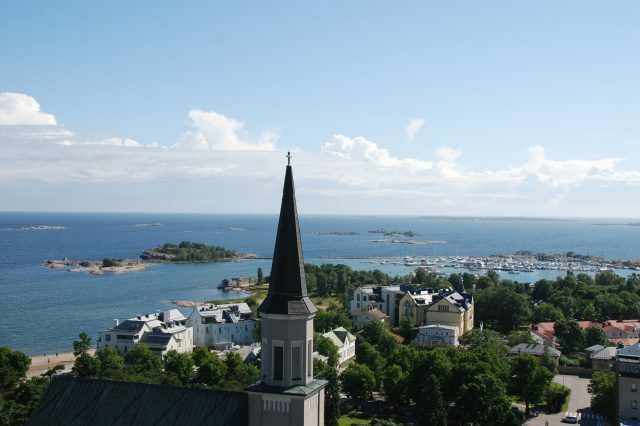 Located at the most southerly point of Finland, Hanko is a delightful harbour town 127km from Helsinki. 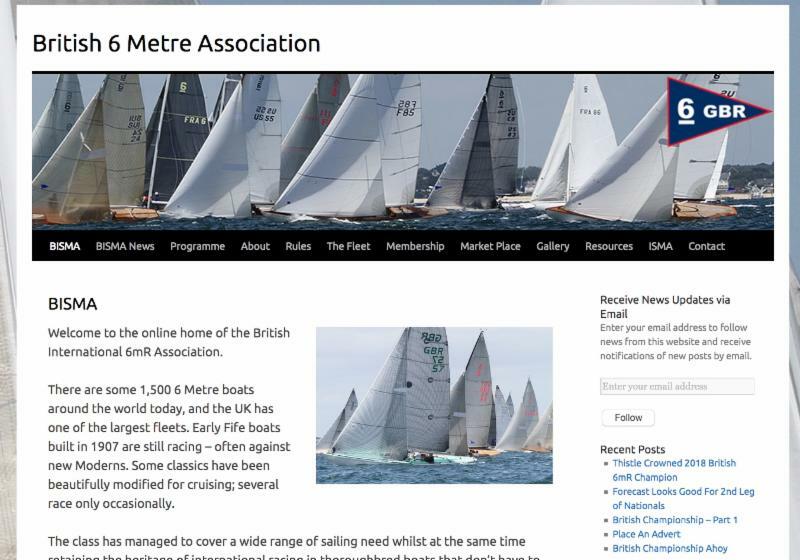 Already several British boats have confirmed their attendance so we hope to see a good BISMA presence at the event. Our new website has an Online Market Place so if you are looking to buy or sell anything Six Metre related do please c lick here for information on how to place an advertisement and to view the current listings. Don't Want To Hear From Us? If you do not wish to continue receiving the BISMA e-newsletter please click the Unsubscribe Link at the very bottom of this email and follow the instructions to remove your email address permanently from the distribution.